Designer Sergio Lozano wanted the Nike Air Max 95 trainer to be a piece of art not just a shoe and so he designed the Air Max 95 based on the human body. The midsole represents the spine, the graduated panels are the muscle fibres, the loopholes and straps are the ribs and the mesh represents the skin. This inspiration from the human body was a breakthrough for Nike being a totally new design which people loved. The Air Max 95 was first released in 1995 with the legendary Air unit but this time it had another air unit in the forefoot which made this running shoe stand out from the rest. The 25 PSI Air reading were put on the Air units and the outsole, making this a serious running shoe. The Air Max 95s also known as the 95s that were produced between 1995 and 1996 had the Air Max 95 logo on the tongue of the shoe and came in a specially designed box. 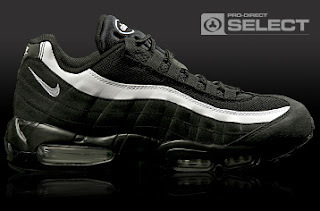 The 95s produced after 1996 do not have the Air pressure on the Air units. Nike added a zip shoelace cover but it didn’t prove to be a hit so they quickly changed it back. The Nike Air Max 95 trainers are one of the biggest sellers for Nike and are still coming up with different colour ways and fabrics today, so grab your pair before everyone has your colour way.